Not since the introduction of HIPAA transactions over 15 years ago has there been a project that impacts healthcare data processing like the implementation of ICD-10. This code set conversion impacts almost every business process for every partner in the exchange of healthcare data. The fact that this change impacts so many systems and partners in the collection and exchange of healthcare data means that the risk of financial setbacks due to the implementation of these codes is very high. Many healthcare providers, and their vendors, are modifying data collection systems to use the new code set. Staff are being trained to assign the new codes, updated software is being tested to collect these codes as part of the patient record. At the other end of the process, health plans are building new systems to use these codes, store them, and adjusting the business rules used for payment using the new codes. Between these business partners is the HIPAA transaction that will transfer these new codes from the provider to the payer, the ANSI 837 claim transaction. The good news is that the conversion to version 5010 four years ago included the ability to store both the current version (ICD-9) or the future version (ICD-10) in the diagnosis data segment of the electronic claim and the ability to identify which code set is used in a specific claim or even specific code. Unlike many other information systems used in the healthcare industry, the format of these transactions does not need to be changed to accommodate the new, larger codes or the additional quantity of these codes that will need to be collected. That being said, testing your claims processing software should not be overlooked as part of your ICD-10 readiness evaluation. Claim files should be examined to verify that they properly collect and format the ICD-10 codes in their entirety and that they use the proper qualifier codes to identify these new codes. In addition, many claims processing systems depend on a proprietary processes to import claim data. These import processes may depend on older claim data formats that will not properly transfer these new codes. These older processes may take time to replace so they should be identified early by the provider and their vendor. Another issue that must be addressed is the implementation of this code set and its impact on billing since claims will need to be processed with both code sets for a period of time. Claims processing is not a linear process like patient registration where you can implement a procedure that will proceed from a fixed date forward. In billing, you must submit claims that are current and resubmit claims that are older. 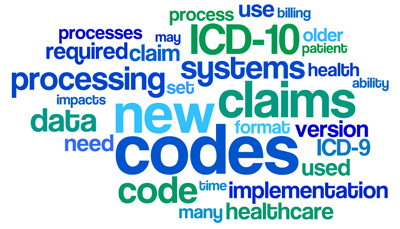 Some will require ICD-9 and others will require ICD-10, after the implementation of the new codes. Claims processing systems that are designed to handle a transition period where both sets are used will be required. Another issue that will need to be addressed is the ability of health plans to adopt this standard in a coordinated manner. Regardless of legislation, the reality of claims processing is that the provider is required to submit claims in a format acceptable for payment by the health plan. When the 837 was mandated by CMS in 2003, many other health plans, including some state Medicaid programs, could not yet accept the new format. This required temporary processes to create both formats depending on the payer requirements. The same occurred with the implementation of 5010, when the new version was required by CMS, some other payers could not accept the new version. For example, California Medicaid required 4010 for at least another year. This meant that vendors, like MEDTranDirect, had to be able to create 837 4010 or 837 5010 based on the entity receiving the file. How will your facility handle this issue? When older claims are resubmitted, will you be able to use ICD-9 after ICD-10 is implemented? When a payer reports that their system is not prepared to process claims with ICD-10, can you still submit claims with ICD-9? It is important to remember, there is no cross walk between these systems. It is possible that for a period of time you may need to code patient records with both code sets and design your claims processing to use either, depending on which one will get you paid. Our billing software, 837Direct supports both ICD-9 and ICD-10 codes with built in rules to ensure that correct codes are being used. Contact us to see how we can help you with your transition plan.